The Reading Center hosts outreach events throughout the state every year. Last year, we reached more than 5,000 people, many of whom were new to dyslexia and The Reading Center. If you are interested in having one of our staff speak or participate in your event, please contact us at 507-288-5271. Each fall The Reading Center hosts a series of outreach events on the topic of dyslexia. Events have included Adults with Dyslexia panels, Legislative laws Panels, Simulations and Open Houses. Throughout the year we hold outreach events in Rochester and by invitation elsewhere. If you are interested in having The Reading Center host or participate in an outreach event, please contact us at 507-288-5271. 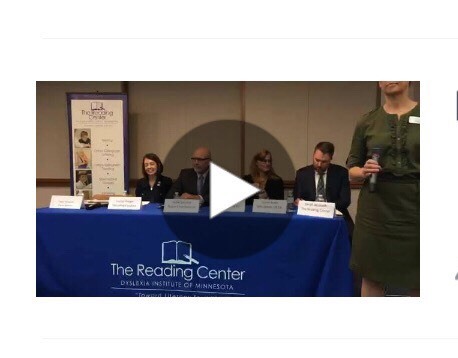 To learn more about state law impacting students with dyslexia, view our panel from October 2017. Panelists included (left to right): Minnesota State Senator Carla Nelson (Chair, Senate Education Finance Committee), Rachel Berger (Founder, Decoding Dyslexia Minnesota), Minnesota State Senator Roger Chamberlain (Chair, Senate Taxes Committee), Dr. Vicki Weinberg (Learning Disabilities Specialist, Minnesota Department of Education), Daron Korte (Assistant Commissioner, Minnesota Department of Education).